I’ll admit I have a mild frittata addiction. I love how easy they are to make and how you can add different ingredients and completely change the flavour. My go-to ingredients have been bacon and onions. I don’t know why it took me so long to think of adding sausage! I mean sausage is a breakfast food right? 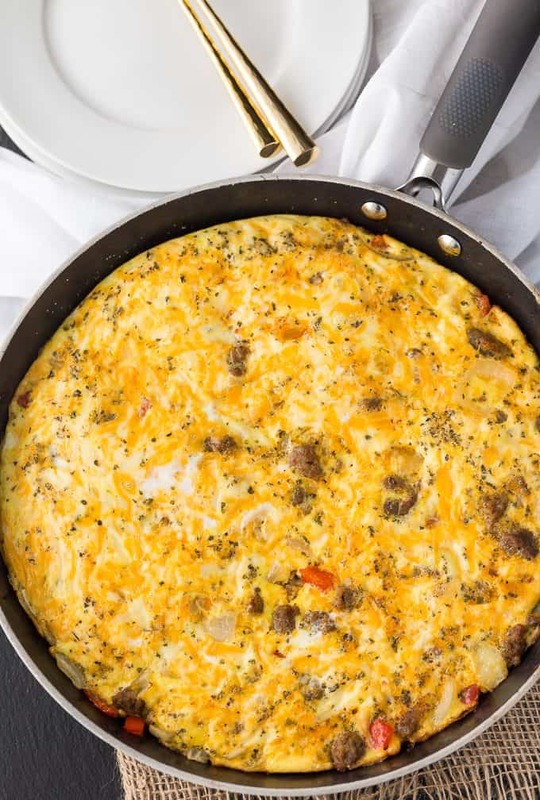 This Sausage & Red Pepper Frittata also has fresh marjoram which looks similar to oregano. However I find it has a milder flavour. In terms of the cheese and sausage, feel free to use whatever you have on hand or whatever your tastebuds prefer. I myself like mild Italian sausage so that’s what I used. I also found a new cheese at our grocery store that I wanted to try. It’s a Goat’s Milk Cheddar & Mozzarella infused with olive oil, garlic, parsley and red and green bell peppers. It worked really well in the frittata and added another element of texture and taste. A hearty and filling low carb brunch recipe! In a large bowl, whisk eggs, cheese and marjoram and set aside. Melt butter in a large skillet over medium heat. Add onions, red pepper and sausage (removed from casing and broken up into smaller pieces). Cook for about 10 minutes or until sausage is cooked and veggies are softened. Add egg mixture to the skillet and continue cooking on the stove for 2 minutes. Move the skillet to a 350°F pre-heated oven and cook for 15 minutes. That sounds amazing. The perfect summer meal! Looks like quiche, I’ve never tried a fritatta. Oh wow. I want to try this one for sure. Sounds delicious. Look really delicious. May have to try this. This looks very appealing and inviting to try. I love its simplicity since it is after all the first meal of the day. I will definitely try this and with changing the cheese selections the possibilities are endless. This looks amazing! Going to give it a try! Yum! A nice, light spring/summertime supper! I love Sausage & Red Pepper I make a lot of eggs with them. I will have to try your recipe. Oh my goodness, this looks so delish!!! I love these easy types of meals, and this is similar to Quiche which we make a lot. Definitely sharing this and will be making it soon; we love mild Italian sausages and use them a lot in our recipes. I too love frittatas because you can change them in so many different ways. The new cheese you found sounds delicious. I shallhave to see if we have anything similar around here. Looks and sounds delicious. I love red peppers in with eggs. The green ones give me heartburn but the yellow, orange or red I can even eat raw -Yum. A good hearty breakfast to start out the day. thanks for the recipe. 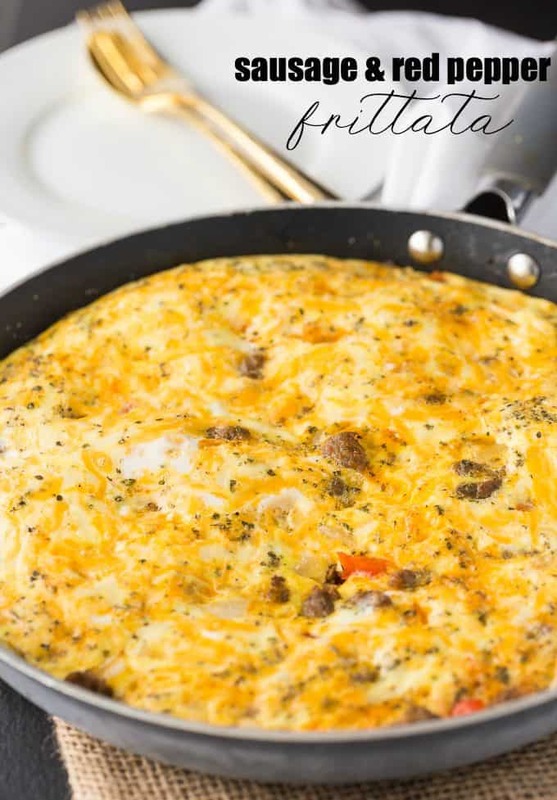 I’ve never actually attempted a frittata…I’m probably the worst person I know for burning or overcooking eggs, but I think this recipe would go over well in our home 🙂 Thanks! 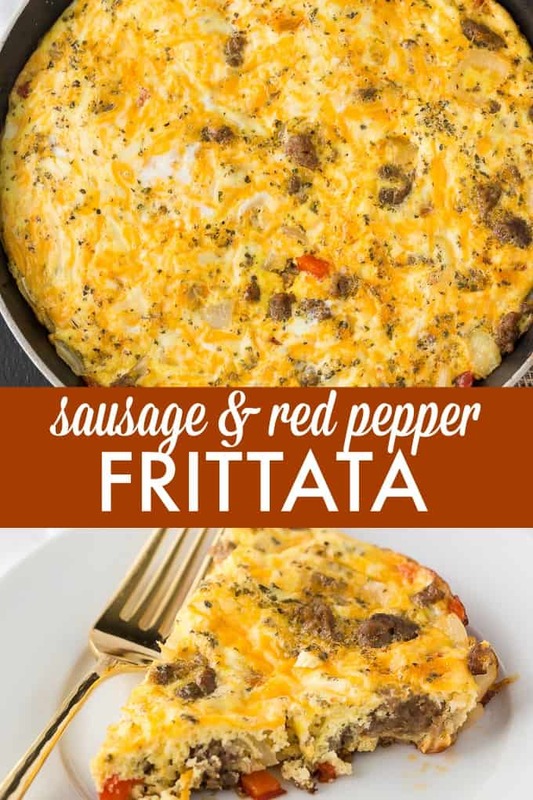 Yum, I love frittatas and this combination of sausage and red peppers sounds delicious! Sounds really delicious. Something wonderful for a breakfast meal. This looks so good. We are in a beginner kick right now and I’m looking for more yummy breakfast ideas. Thanks for sharing! 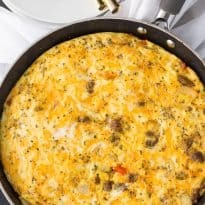 I’ve recently started making frittata and the whole family loves them! This recipe sounds yummy but i’ll probably add mushrooms too. Yum! Guess what I’m making in the morning!! Great recipe! Two of my favourite foods .. sausages and red peppers. This HAS TO be a yummy recipe! Thank you for the suggestion – I have Pinned and hope to use…. This looks soo scrumptious – I would love to have this for breakfast, lunch or supper!!! excellent recipe! Oh my, this looks good! This will be on the Sunday breakfast menu this week. Thanks! I love frittatas too! I’ve done a chorizo and Jack cheese but your mix sounds really good too! Sounds great. Love Italian sausage. WOW! This looks so good! Thank you for sharing. This looks great! My guys would love it too! Might end up on the menu this weekend! I’ve never tried unfortunately so I don’t know for sure! That looks so good. I’ve been in the mood for breakfast for dinner and this just made the short list!